A first mainstream airing for a wonderful recording first issued privately in 2008. This is 'modern' piano music at its best: summed up by one reviewer as 'intensely pleasant music', occasionally challenging to the listener (to say nothing of the performer), but always engaging—an infectiously melodious fusion of influences at once reminiscent of Bach and Einaudi. With more than an occasional hint of humour. And a ruler. 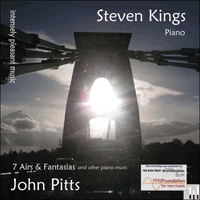 This recording is also available as a CD (CD.TP/ipm08) from www.johnpitts.co.uk. changes. A coordinated high-speed rotation of a peal of bells. toccata (It. toccare ‘to touch’). A virtuosic fantasia-like composition, usually requiring immense dexterity, and played with such rapidity that the fingers have time only fleetingly to touch the keys. air (It. aria). (1) a melody or tune, the flowing upper part of a texture. (2) a composition which is dominated by melody. fantasia (It. ‘fancy’). (1) an instrumental piece in free form, improvisatory in substance or character, in which structure yields to the imagination. (2) any type of composition for which no other formal classification happens to occur to the composer.